by Rickford Grant with Phil Bull. 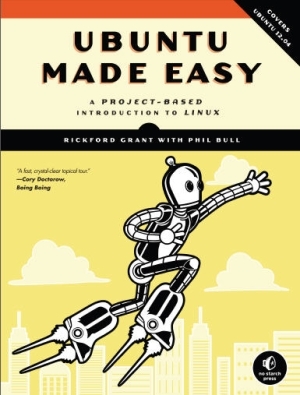 If you’ve never used Linux or the Ubuntu Linux distribution, Ubuntu Made Easy is the book for you. The authors take a light-hearted approach to teaching you the ins and outs of Ubuntu Linux (Includes the latest version 12.04). The book is a good introduction to Linux in general and to Ubuntu specifically. This book would be especially well-suited for middle school, high school, community college or adult continuing education classes. It is also light enough for older readers to comprehend. I like the book because it leaves out all of the hype and mumbo jumbo that only us geeks get into. The audience for this book is Everyman (and Everywoman) not for computer nerds or techno wizards who already know everything. You’d be hard-pressed to find a gentler introduction to Linux and how it works from a user’s point of view. The book seems written by and for people with a bit of attention deficit disorder. But, who has time to pore over lots of words these days? The attention span-deprived will appreciate the no nonsense, no extra words style launched at you by Grant and Bull. If you want to read a novel, read a novel but if you want to get into Linux quickly and become productive than “Ten Days” or “24 Hours,” then you need to find this book. Like most books from No Starch Press, the book is easy to read and has ample whitespace in the margins for you to take notes. The authors have also taken the time to create a familiar environment for you Windows and Mac folks out there who want to try something different. Perhaps you’ve heard of Linux and want to give it a go or you’ve decided that commercial operating systems are just too stuffy for you. Grant and Bull make it easy to make the switch from Windows or Mac by giving you the opportunity to install Linux alongside Windows. And, they give many references to Windows and Mac for comparison, which is extremely helpful for those who might have reservations about switching to a foreign environment after so many years with another operating system. These two guys have been around a while and they understand that making the quantum leap from one operating system to another is no small feat. They loaded the book with what feels like personalized instruction and a lot of pictures of actual, current Linux desktops. The graphics and instructions are clear, simple and easy to follow. At approximately 400 pages and 22 chapters, including one on troubleshooting, you’ll find everything you need to get started, work productively and enjoy Linux. Grant and Bull chose well with Ubuntu Linux. It is arguably the best Linux distribution for dabblers, new converts and old pros alike. I personally love Ubuntu Linux and I love this book. It’s well worth the price and, if I ever teach Linux again, it’s the book I’ll use. And, when people buy print books directly from http://nostarch.com, we give you the DRM-free ebook (usually PDF, Mobi, and Epub) for free.